Did you watch SNL this weekend? Probably not. But you might have watched clips of various hand selected successful sketches from SNL assembled by bloggers assigned to cover SNL and write recaps about it. 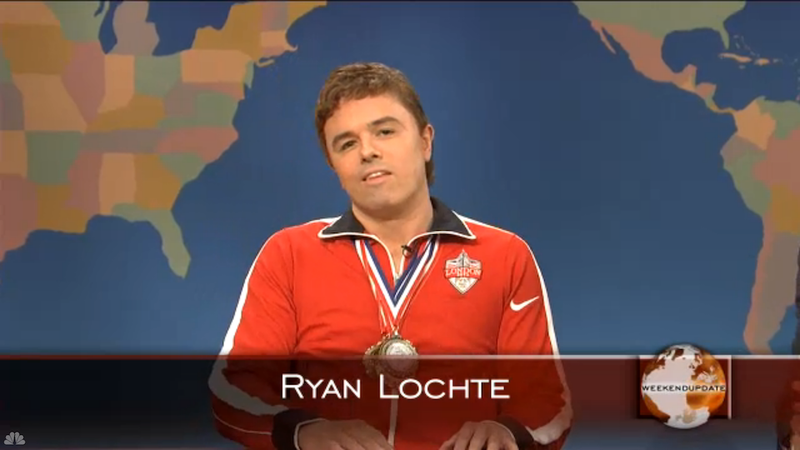 And among those clips was yet another sendup of Ryan Lochte, this time with Seth McFarlane playing the decorated Olympian as a barely verbal dolt. Well, guys, the gig's up. Nobel Laureate Ryan Lochte saw the sketch, and had Words To Say about it. The sketch featured Family Guy creator and voice actor Seth McFarlane saying things like "it feels so weird to be dry" and mispronouncing the name of Matthew Perry's newest smarm vehicle Go On as "goon." Later in the segment, he pronounced "good" as "go od." Man. Dumb people, amirite? Lochte saw it, and thought it was "pretty harsh," but also "cool." Well, I gotta admit that was a pretty harsh one, but it's cool to have Seth parody me. I think he pegged me wrong, but when I heard he did a skit I knew I was in for it! It's all in fun, and of course, if I'm talked about on ‘SNL,' I know they are gonna get me go-od. That last part is the sentence his publicist wrote to make him appear less Wo Oden. RS: The feminist blog Jezebel named you America's Sexiest Douchebag. Were your feelings hurt? Lochte: Well, I like the Sexiest American part. The douchebag part, I think they got that from the clothes that I wear. Yeah, I mean, it's whatever. It is what it is. And there you have it. Harsh, but, like, cool. It's like whatever. Like all things. Three swims.